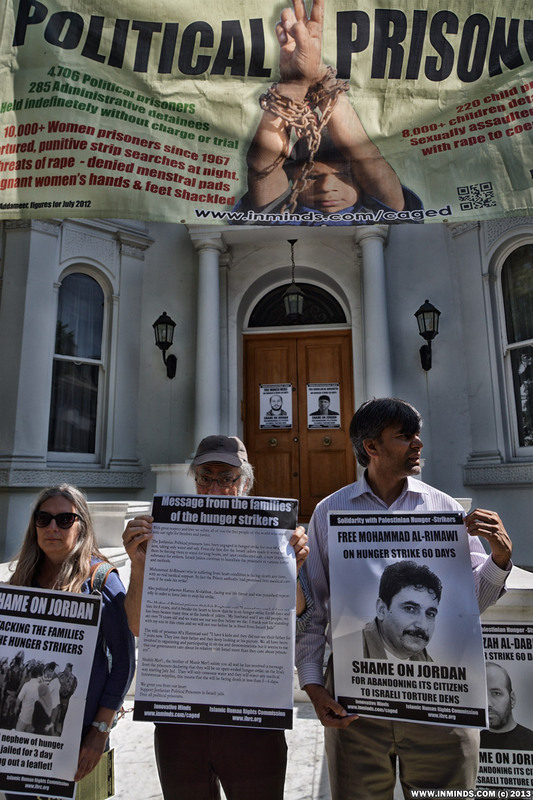 On Sunday 30th June 2013 activists protested outside the Jordanian Embassy in London in solidarity with the five Jordanian hunger strikers on their 60th day without food, who have been abandoned by the Jordanian government to rot in Israeli occupation dungeons. 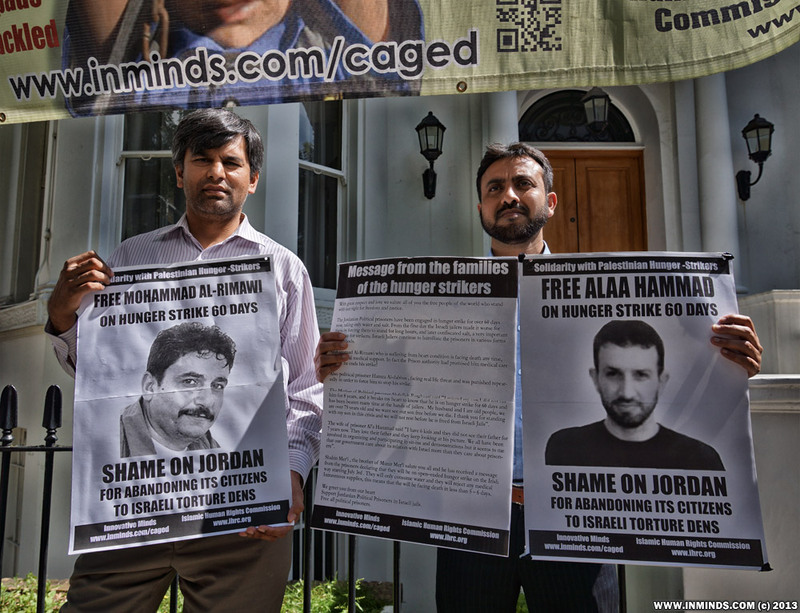 The protest organised by the Palestinian Prisoners Campaign ( http://www.inminds.com/caged ) was at the request of prisoners families and activists in Jordan and was co-ordinated to time with a protest held in Jordan outside the Jordanian Parliament. 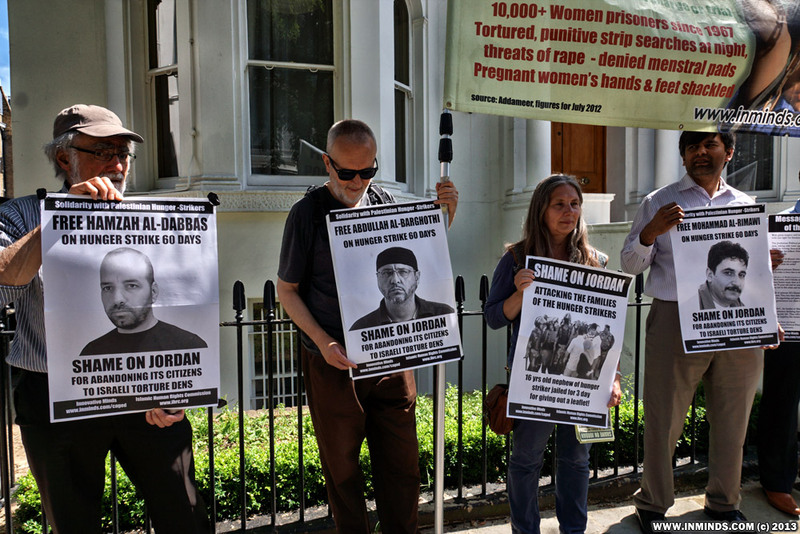 A message from the families of the prisoners was read out outside the Embassy of Jordan in London. 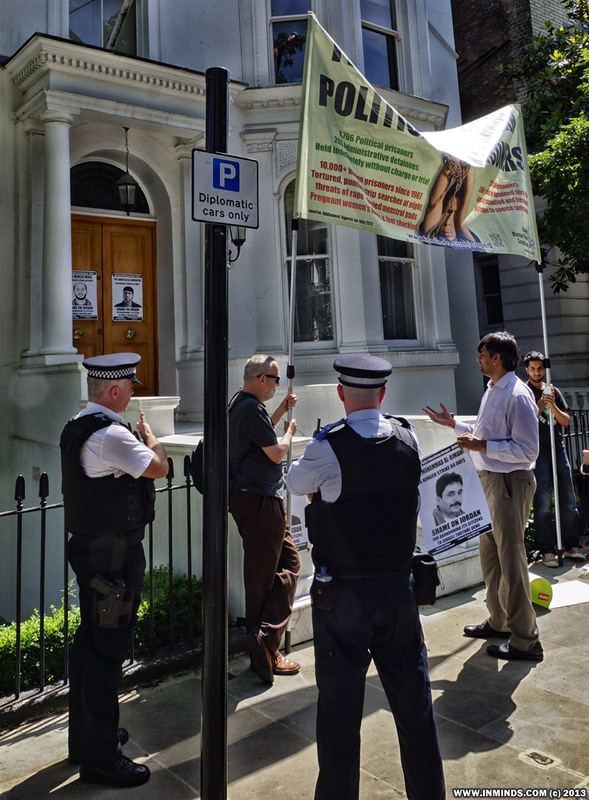 Staff inside the embassy wouldn't open the door..
We extend our respect and love to all those who stands with our children's just cause. We are delighted to hear such screams that appeal for justice and freedom. 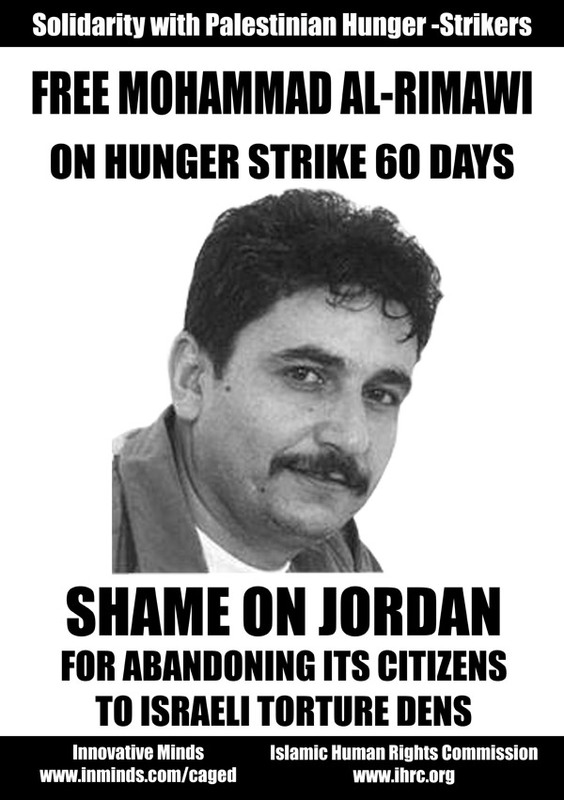 Our children, the Jordanian detainees in Israeli jails, have been on hunger strike for 60 days. In the hope of gaining their freedom they have decided to feed their dignity with water and salt. Since the first day their jailers have sought to suppress them. They've been deliberately humiliating them denying them salt which prevents their intestines from rotting and forcing them to stop their strike as their health deteriorated. Mohammed Remawi, who has heart problems and suffers from a lung and intestine infection, as well as Mediterranean fever that threatens his life, has endured medical negligence. 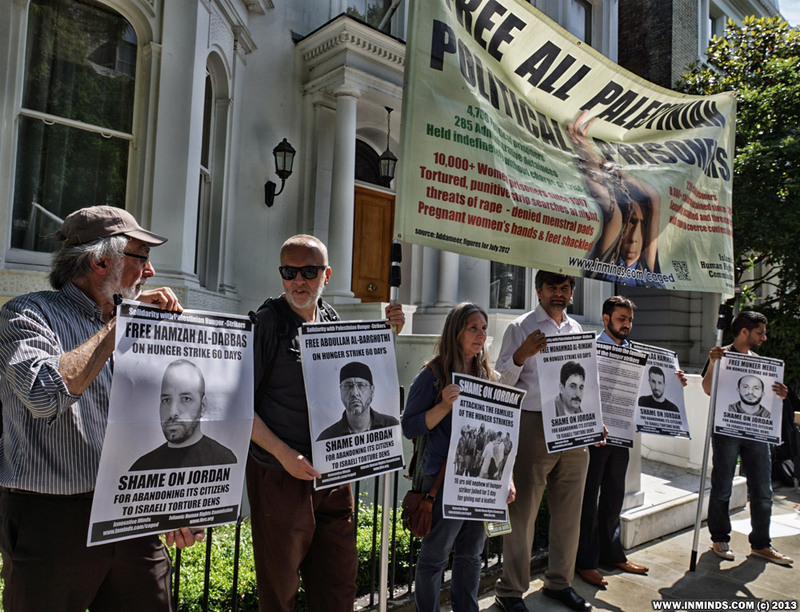 Prison authorities insist he will not receive treatment until he ends his hunger strike. 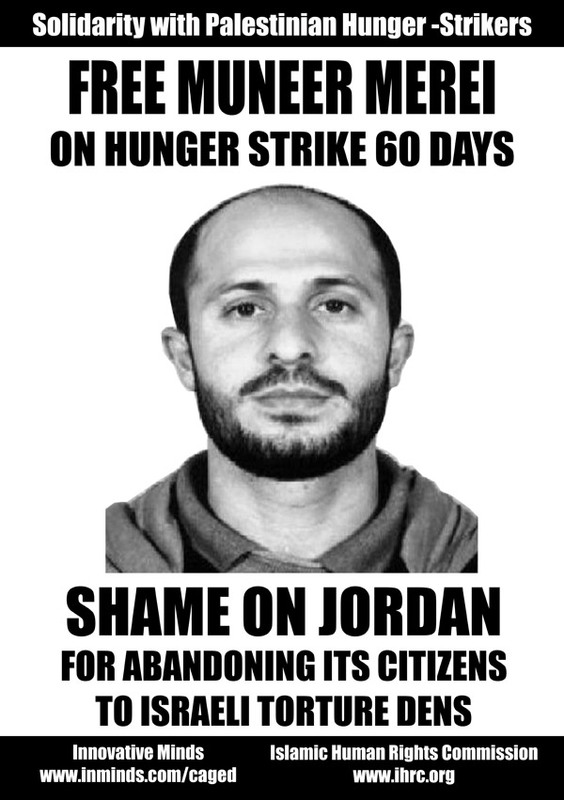 The same applies to Hamza Dabbas, who has resisted all attempts by the prison authorities to break hunger strike. 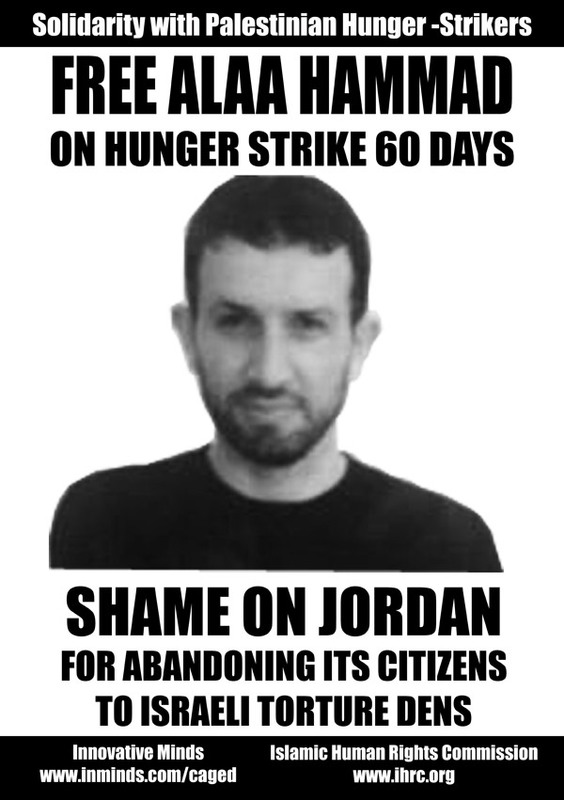 The mother of prisoner Abdullah Barghouti says: I miss my son, I have not seen him for 8 years and my heart is aching that he has been without food for 60 lying is his bed of sickness shackled by the feet. This most difficult moment of my life was when I heard from the lawyer that he was beaten and that bruises cover his face and body. Both I and his father are already more than 75 years old. All we hope is to see him and hug him before we die. Thank you for standing by my son in this ordeal; we shall not rest until they they're freed. 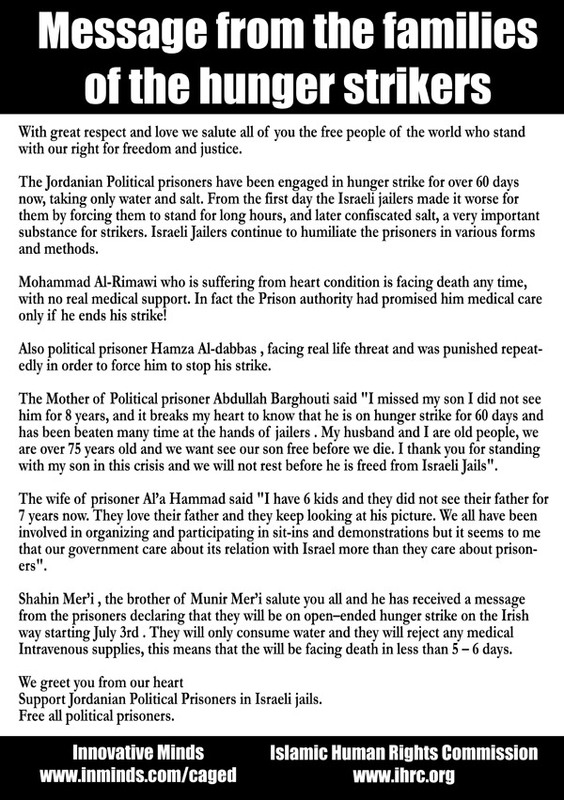 Prisoner Hammad's wife says in a message that her six sons have not seen their father for 7 years. Before his detention, his children were closely attached to him. 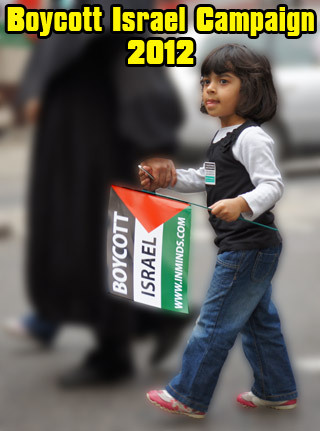 For the past sixty days, I've been going out every day with my children to protest but to no avail. The government does not seem to care about us. 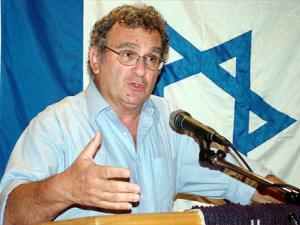 It would seem that its interests with the Israeli enemy is more important than my husband and his heroic comrades. 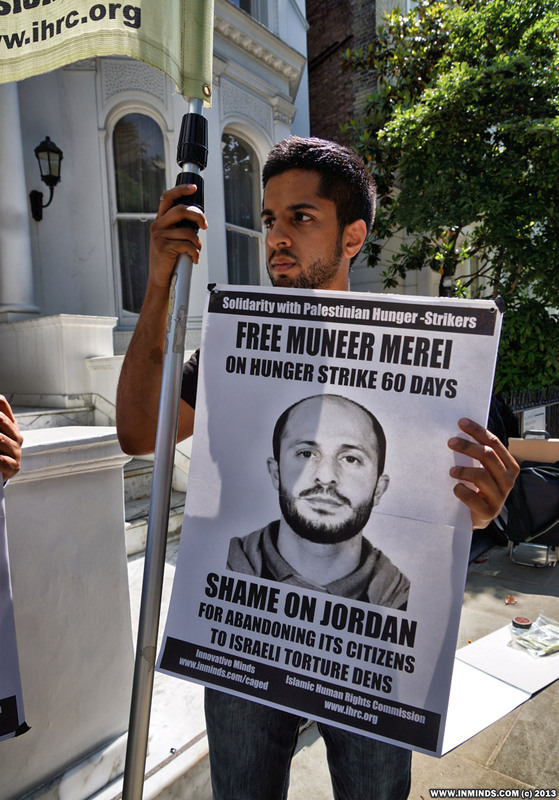 Prisoner Munir Mari's brother, Shaheen Mari, says the following: Captive Munir Mari sends you warm greetings and says that the five prisoners are determined to engage in an Irish style hunger strike on 3-7-2013; this is the harshest type of hunger. It entails refraining from everything except water. It would include the rejection of any medical intervention to administer intravenous fluids. As a result of such a strike they would die in five days. The road of victory is fraught with sacrifices.. Please support them with all of your means because theirs is a just cause and they deserve to be supported. 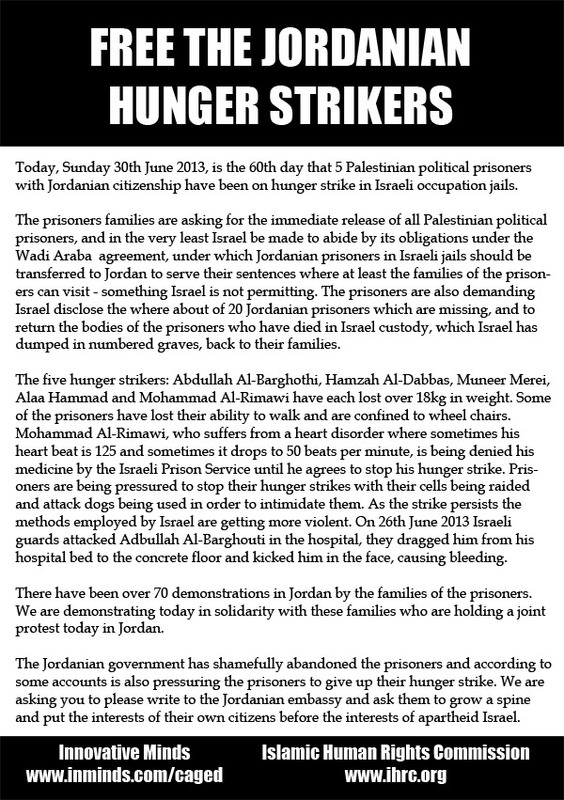 Sunday 30th June was the 60th day that 5 Palestinian political prisoners with Jordanian citizenship have been on hunger strike in Israeli occupation jails. 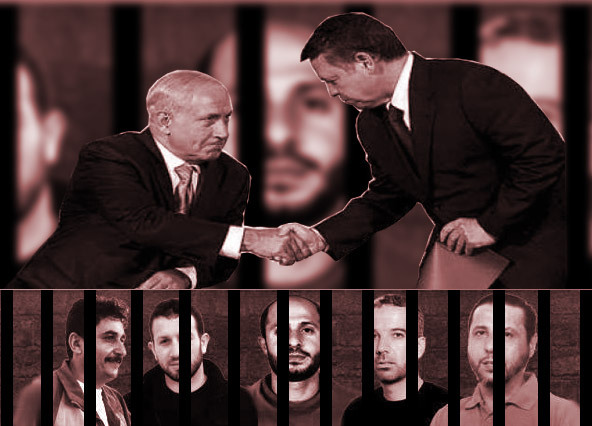 The prisoners families are asking for the immediate release of all Palestinian political prisoners, and in the very least Israel be made to abide by its side of the shameful Wadi Araba normalisation agreement which King Hussein signed with Israel in 1994, under which Jordanian prisoners in Israeli jails should be transferred to Jordan to serve their sentences where at least the families of the prisoners can visit - Israel is at present preventing families of the prisoners from visiting them. 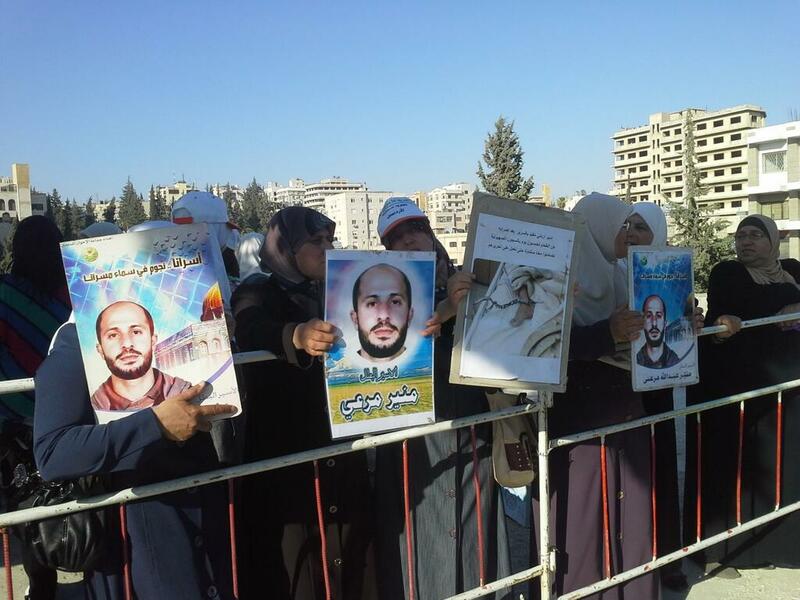 The prisoners are also demanding Israel disclose the where about of 20 Jordanian prisoners who are missing, and to return the bodies of the prisoners who have died in Israel custody, which Israel has dumped in numbered graves, back to their families. 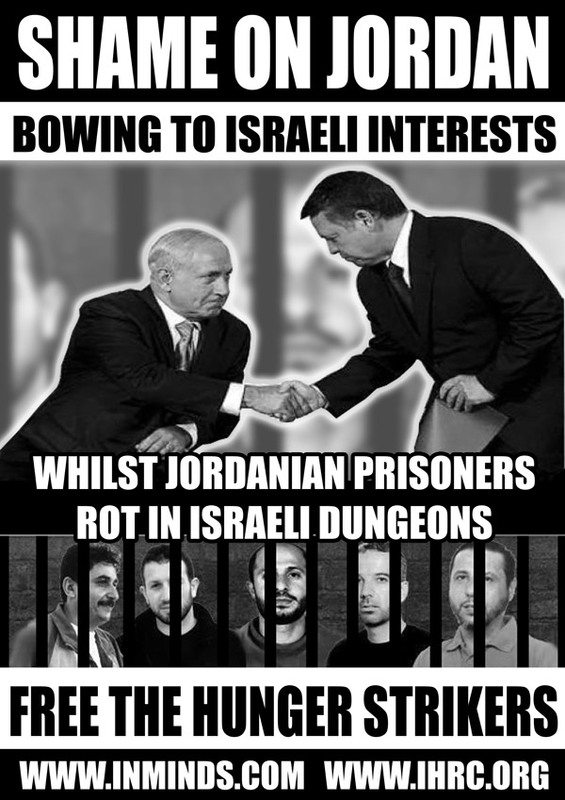 It should be noted that Jordanians have consistently demanded their government tear up the treacherous Wadi Araba peace agreement in which King Hussein sold out the Palestinians, and in return gained nothing other than shame for Jordan. 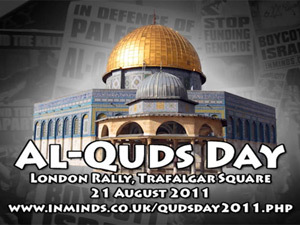 Needless to say Israel has been a serial violator of the treaty from day one.. its assassination attempt of Khaled Meshaal in 1997 to its Judaisation of Jerusalem, and its restrictions on access to holy places in Jerusalem.. 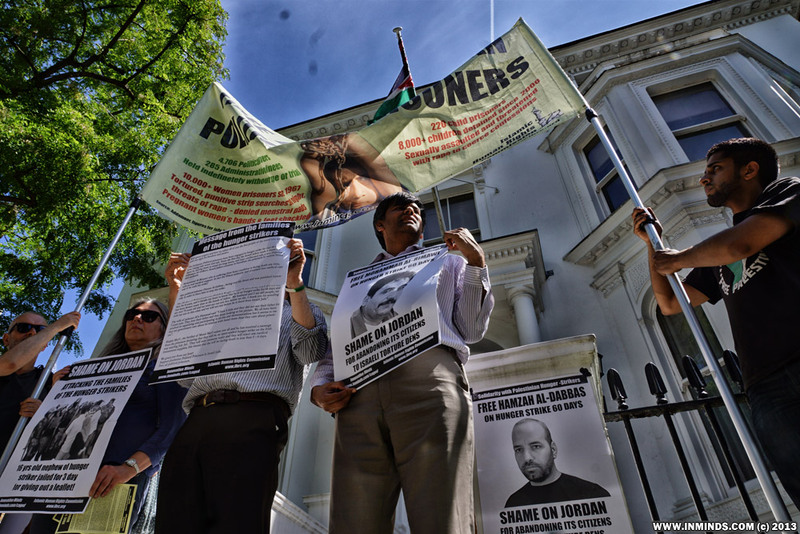 The five hunger strikers: Abdullah Al-Barghothi, Hamzah Al-Dabbas, Muneer Merei, Alaa Hammad and Mohammad Al-Rimawi have each lost over 18kg in weight. Some of the prisoners have lost their ability to walk and are confined to wheel chairs. Mohammad Al-Rimawi, who suffers from a heart disorder where sometimes his heart beat is 125 and sometimes it drops to 50 beats per minute, is being denied his medicine by the Israeli Prison Service until he agrees to stop his hunger strike. 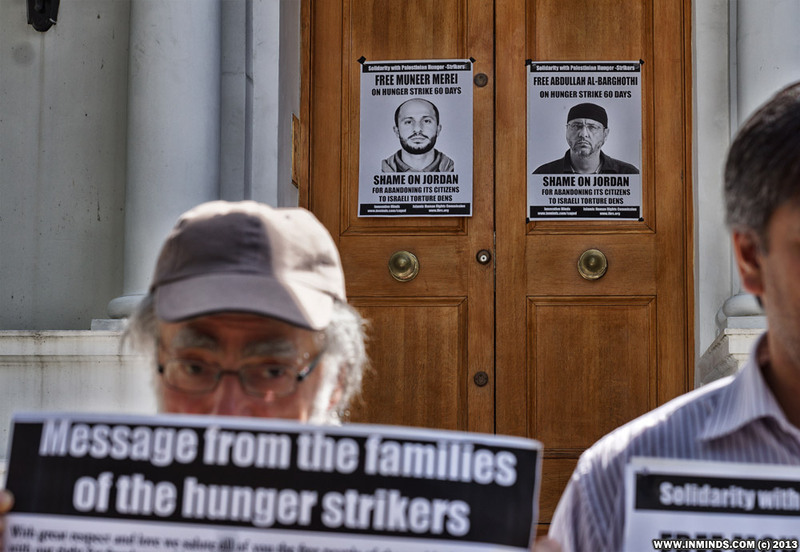 Prisoners are being pressured to stop their hunger strikes with their cells being raided and attack dogs being used in order to intimidate them. 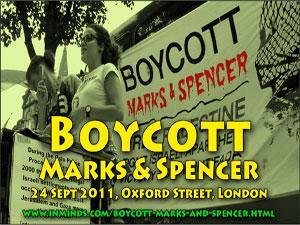 As the strike persists the methods employed by Israel are getting more violent. 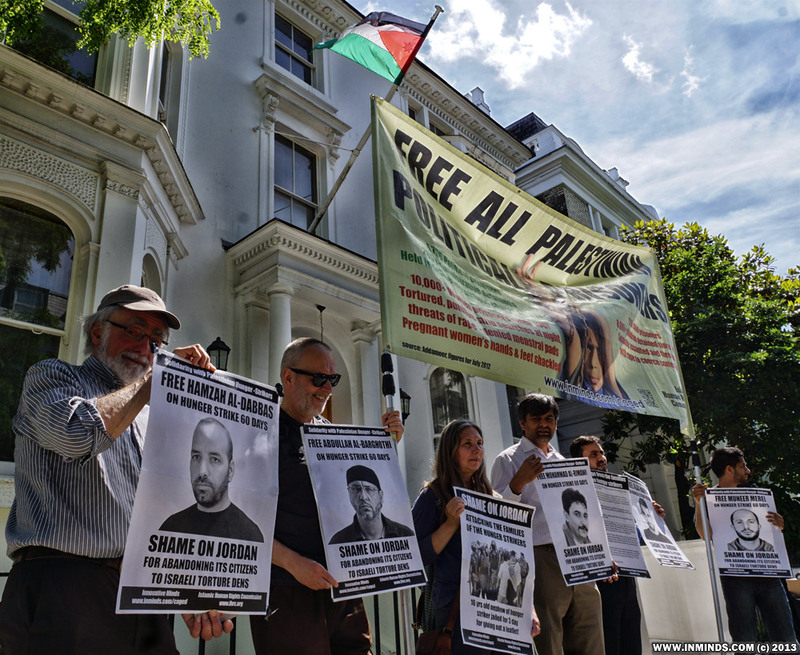 On 26th June 2013 Israeli guards attacked Abdullah Al-Barghouti in the hospital, they dragged him from his hospital bed to the concrete floor and kicked him in the face, causing bleeding. 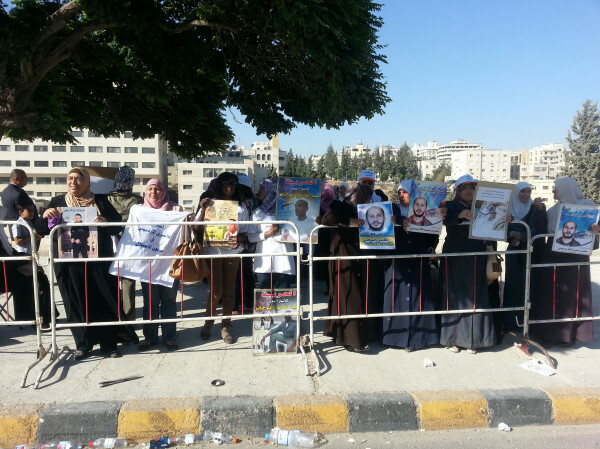 There have been over 85 demonstrations in Jordan by the families of the prisoners - elderly mothers standing in the burning sun, at several protests each day! Even a 22km solidarity march from one city to another.. All of this falling on deaf ears with the Jordanian government shamefully abandoning the prisoners and according to some accounts even pressuring the prisoners to give up their hunger strike. Terrified by the iron will of the families and friends of the hunger strikes to relentlessly carry on protesting everyday and the support and respect they garner in wider society and the resulting momentum building up to end the states total submission to every whim of the Zionist enemy, the Jordanian security services have come down very hard on the protesting families. 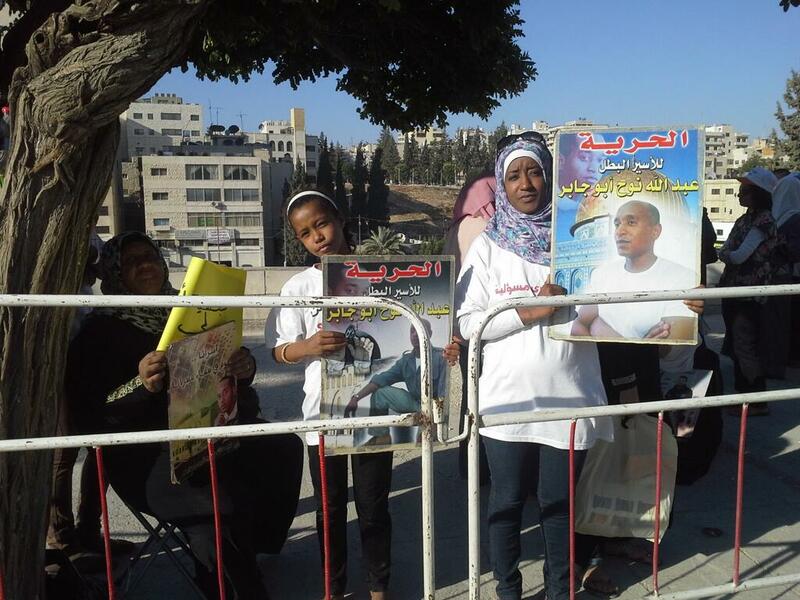 Family members have been threatened with arrest if they persist to champion their loved ones in Israeli dungeons. 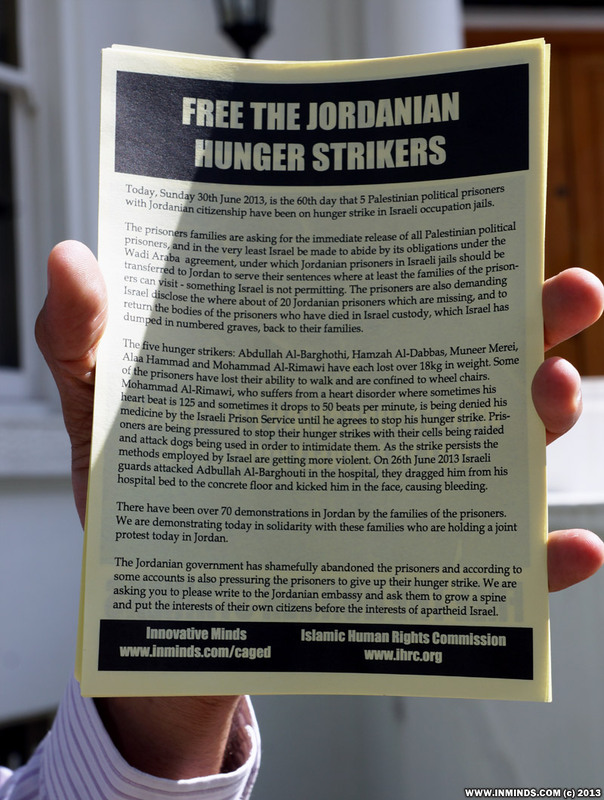 They dragged away a 16 year old boy, a nephew of one of the hunger strikes, to prison and locked him up for 3 days - his crime was to hand out a leaflet about his uncles' imprisonment in an Israeli prison. On another occasion, wearing military camouflage uniforms that have never seen service on the enemy front line, the security forces with batons drawn, attacked a peaceful protest some of which was captured on video (see right). 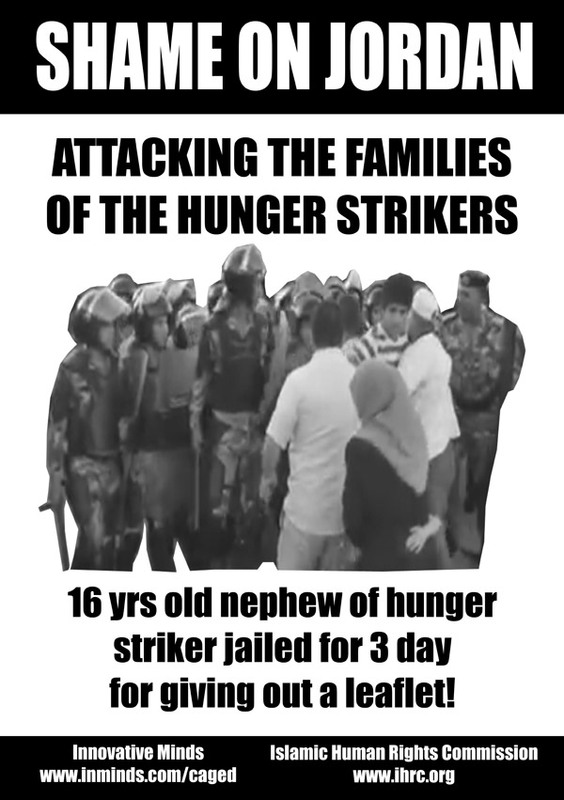 The video also shows plain cloths security service personnel cowardly attacking hunger striker Muneer Meree's brother before disappearing back behind the uniform lines. 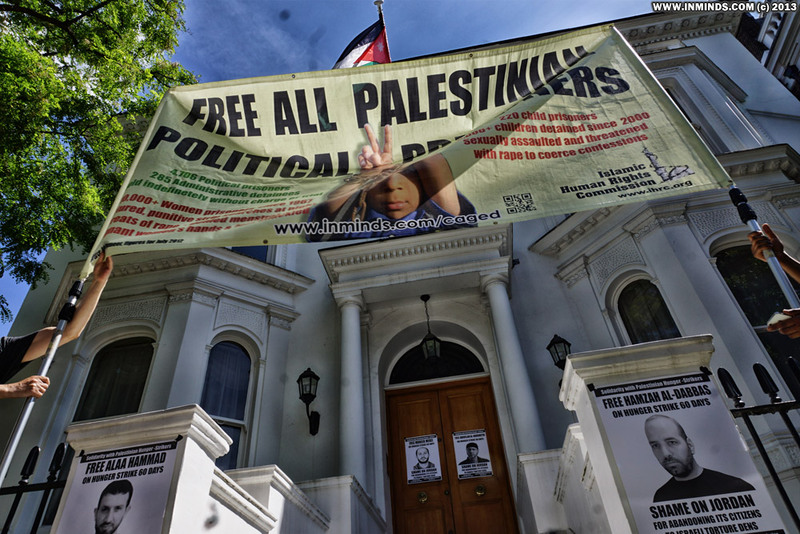 Its with this backdrop of intimidation, that we made contact with activists in Jordan. 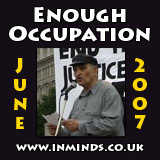 The families and campaigners in Jordan courageously, at great personal risk to themselves, asked us to help internationalise the campaign by protesting in solidarity with them in London outside the Jordanian Embassy in a joint protest, with them protesting in Jordan outside the Royal Court (Central Government buildings) on the same day at the same time. They also sent us a powerful message from the families of the hunger strikers which included a 'game changing' declaration from the hunger strikers, who were already surviving on just water and salt, will now go on an "open-ended hunger strike on the Irish way starting July 3rd they will only consume water and they will reject any medical intravenous supplies" meaning they will be facing death in less than 5-6 days.. 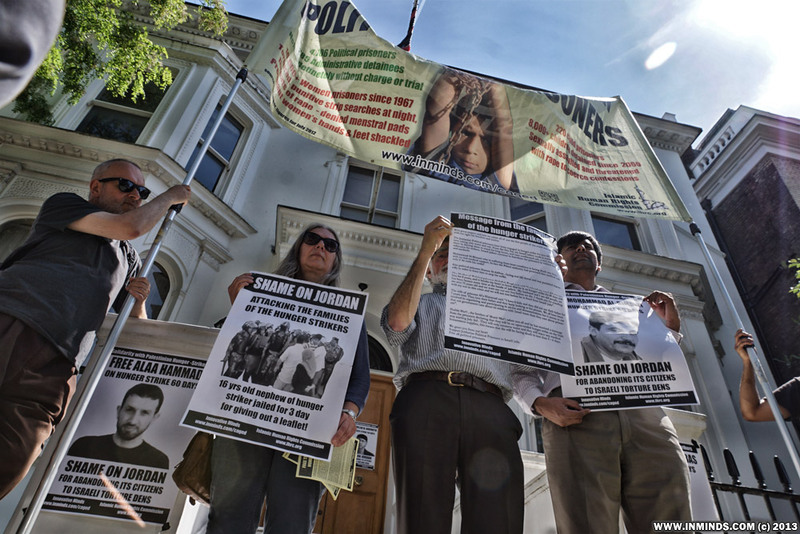 Some of the photos that were tweeted live from our friends in Jordan from their protest, happening is parallel with the London protest..
Just under a dozen activists at very short noticed joined us to protest outside the Jordanian Embassy in Upper Phillimore Gardens, a few minutes from High Street Kensington tube station. 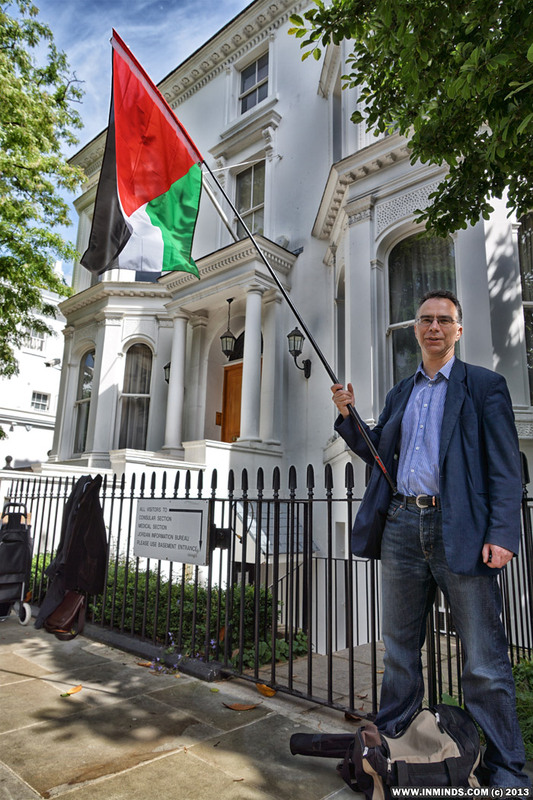 The Jordanian Embassy is only a few streets apart from the more familiar Israel Embassy. Being a Sunday the Embassy was closed to the public although staff were present inside, with lights being turned on, on the upper floors. 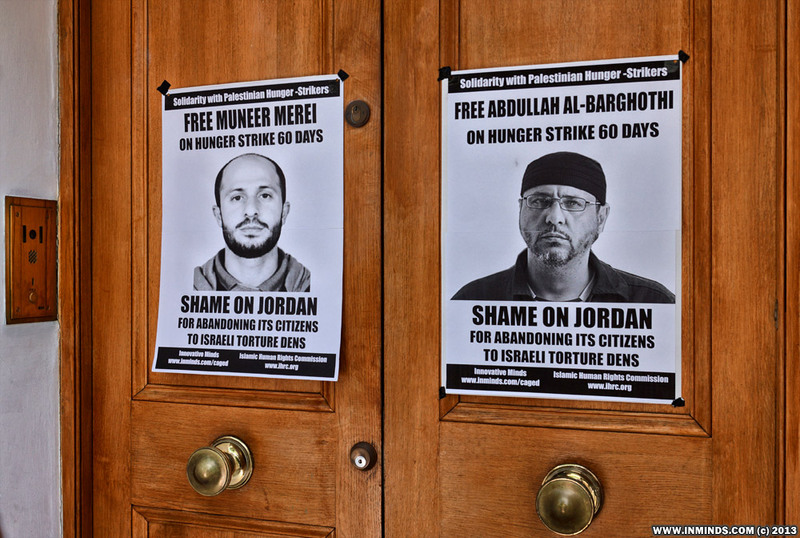 The staff decided not to open the doors to our contingent so we plastered posters of the Jordanian hunger strikers on the doors and walls of the embassy. It was a very quite road, especially on a Sunday, luckily we had brought a PA system to liven things up a bit. 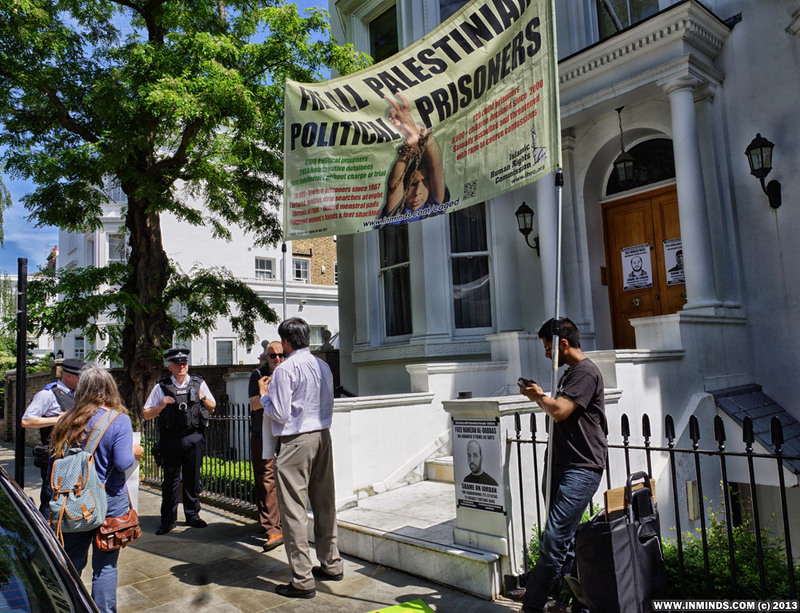 Playing pro-Palestine songs to get the attention of passers-by and the neighbours of the embassy. 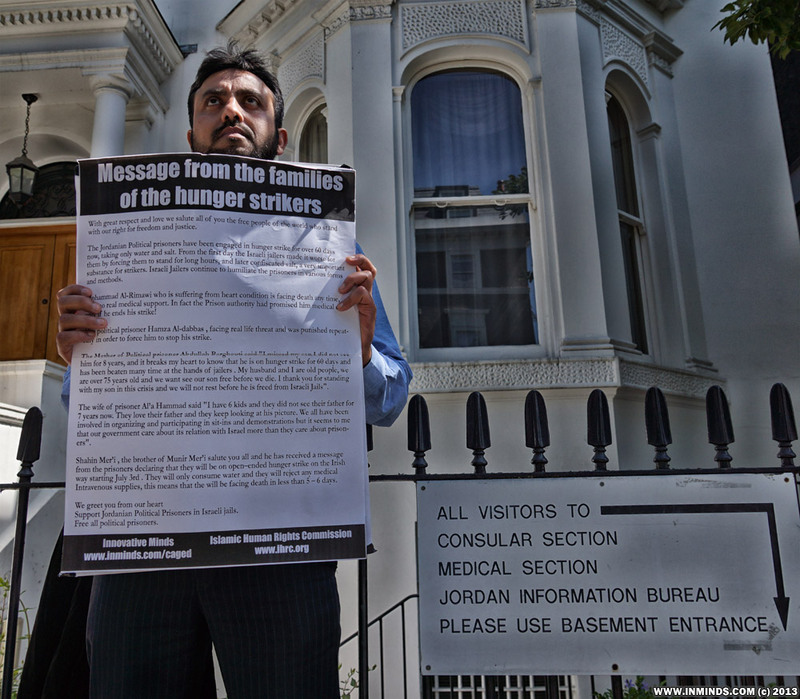 The passionate message from the families of the hunger strikers was then read out. 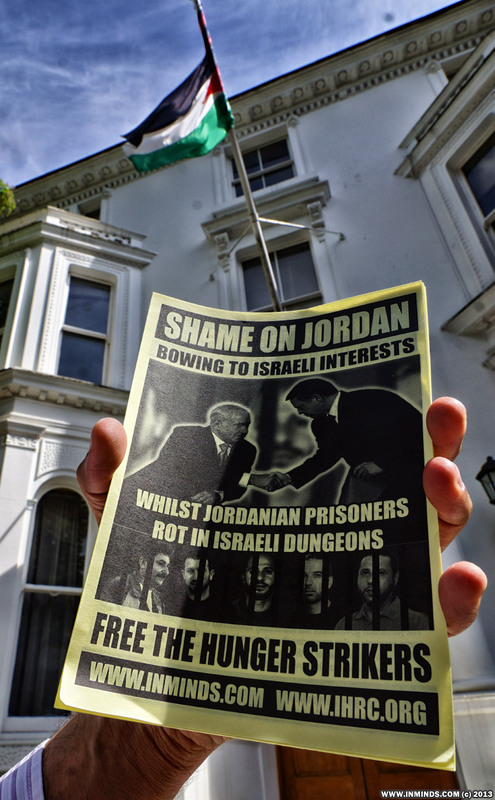 We gave leaflets out explaining the plight of the Jordanian hunger strikers in Israeli prisons, asking people to write to the Jordanian Embassy demanding that they do something. The police were quick to turn up. They were surprisingly civil and reasonable with us. 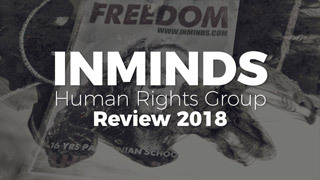 They showed great interest in reading the message of the families of the prisoners and indicated that whilst officially they couldn't say anything, on a personal level they sympathised with our cause as anyone who cared for human rights would. 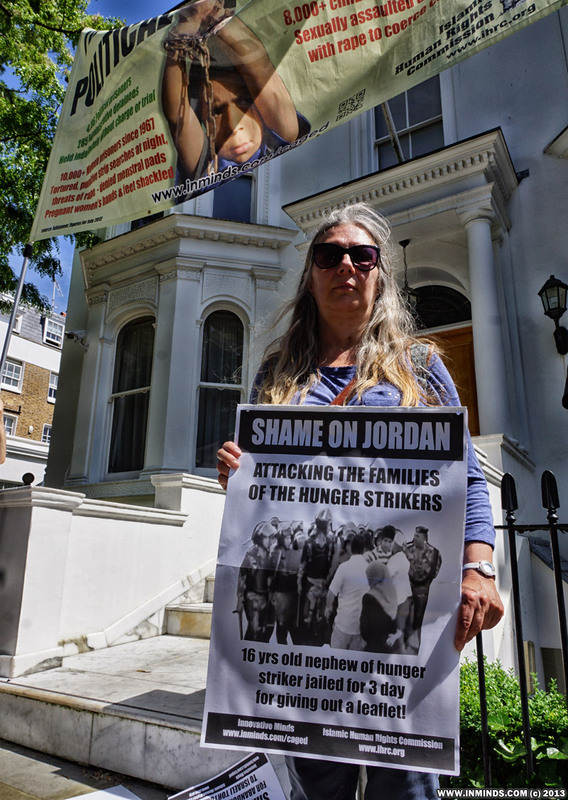 The passer-bys we spoke with weren't surprised to hear how Jordan was complicit in Israels crimes, one local resident said 'the Embassy is my neighbour.. shame on them!'. 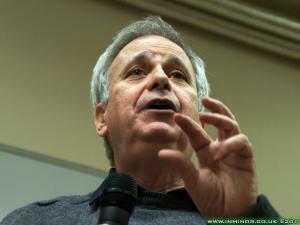 We did encounter one Zionist who seemed to think the Palestinians were holding Israeli prisoners and asked what was being done to secure their release, he wasn't impressed to learn that the only Israeli prisoner was in America, having been found guilty of spying against the US.. 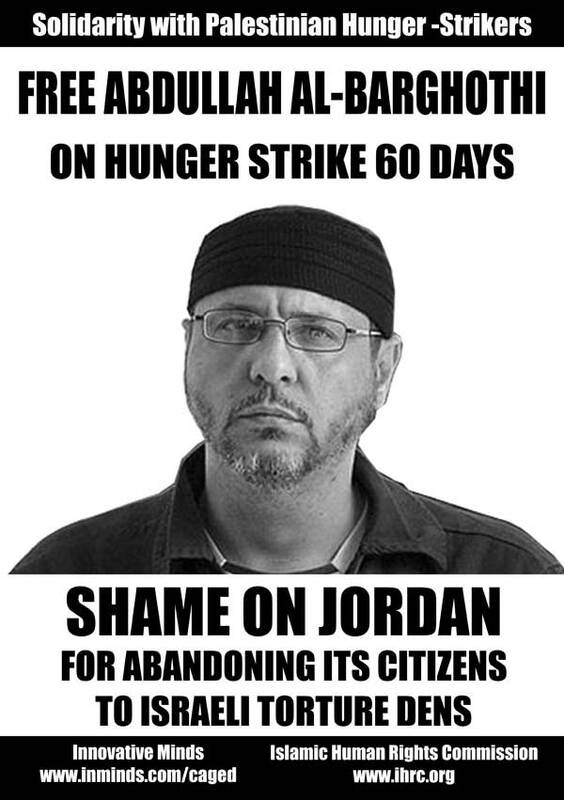 The purpose of the protest was to internationalise the campaign, by shaming Jordan overseas at its capitulation to Zionist interests hopefully pressuring it in to action, and to show international solidarity to the families and activists in Jordan to let them know we are not blind to their plight. 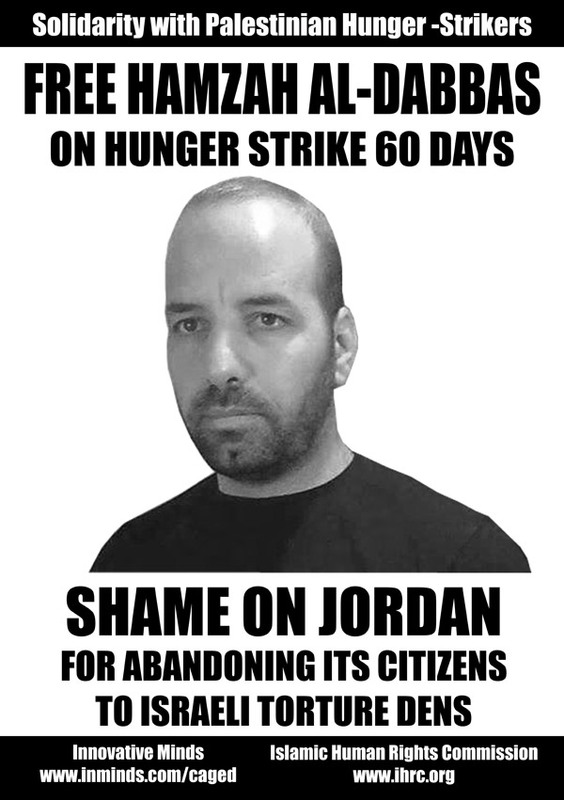 Some of these objectives were achieved with photos of the protest tagged #ShameOnJordan spreading like wildfire across the world via social networking. 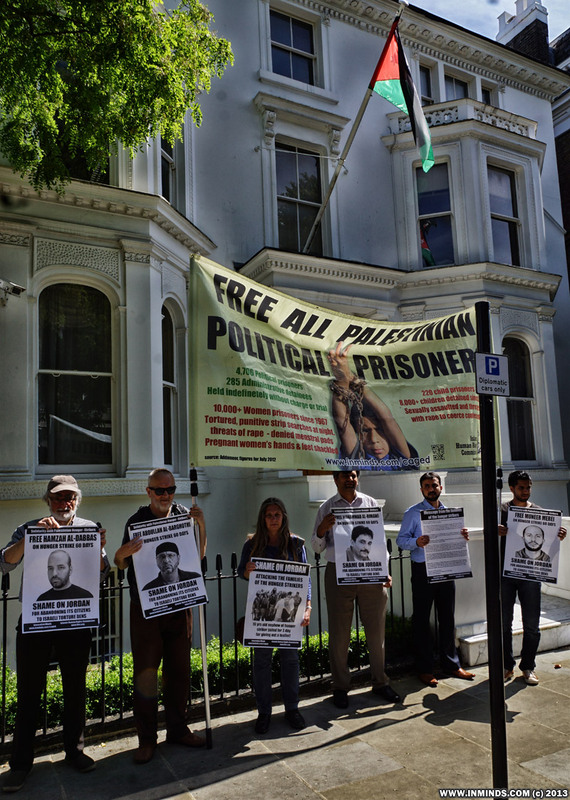 Although we had planned our next Palestinian Prisoners Campaign protest scheduled for Friday 5th July to be outside G4S HQ in London, due to the urgency of the Jordanian hunger strikers campaign with the hunger strikers only surviving on water from Wednesday 3rd July we have decided to hold another protest outside the Jordanian Embassy on Friday 5th July at 2-4pm. 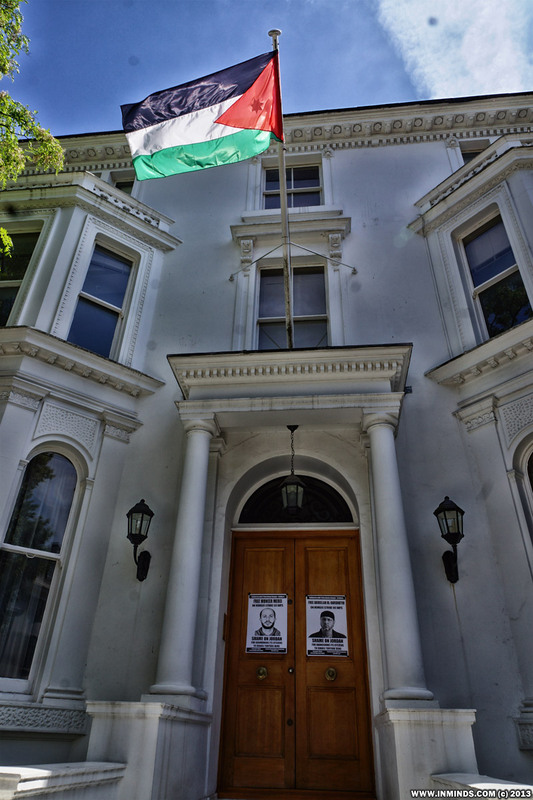 The embassy will be open to the public up to 3pm so please be on time at 2pm. 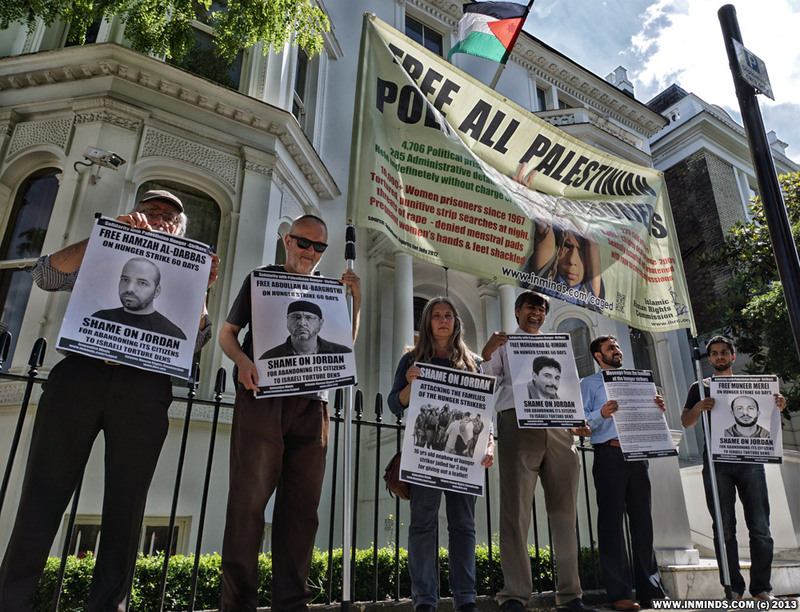 We are calling for more international solidarity, every county has a Jordanian Embassy, why not join us on friday by protesting outside your local Jordanian Embassy. 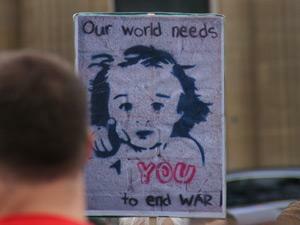 We can provide ready to print PDFs of all the placards, posters and leaflets, if required, for your protest. Please contact us to let us know how we can help. 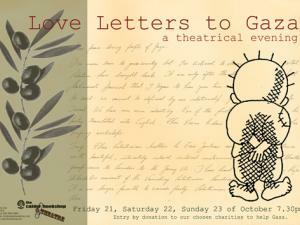 Designs for plcards, posters, leaflets, etc.